Space agencies are now realizing that much of what has previously been achieved using hugely complex and costly single platform projects—large unmanned and manned satellites (including the present International Space Station)—can be replaced by a number of smaller satellites networked together. 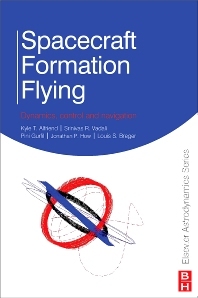 The key challenge of this approach, namely ensuring the proper formation flying of multiple craft, is the topic of this second volume in Elsevier’s Astrodynamics Series, Spacecraft Formation Flying: Dynamics, control and navigation. In this unique text, authors Alfriend et al. provide a coherent discussion of spacecraft relative motion, both in the unperturbed and perturbed settings, explain the main control approaches for regulating relative satellite dynamics, using both impulsive and continuous maneuvers, and present the main constituents required for relative navigation. The early chapters provide a foundation upon which later discussions are built, making this a complete, standalone offering. Intended for graduate students, professors and academic researchers in the fields of aerospace and mechanical engineering, mathematics, astronomy and astrophysics, Spacecraft Formation Flying is a technical yet accessible, forward-thinking guide to this critical area of astrodynamics.